Ben Tre  is the capital of eponymous Ben Tre Province in southern Vietnam. Although only a 20 min ferry-ride away from bustling My Tho, this seems to be barrier enough to give the town a genuine backwater feeling. Tourists are still a scarce species and locals are open and friendly. Ben Tre Province provides some of the most beautiful scenery in the Mekong delta. The milk coffee colored waters wind their way along small channels lined with water palms, thatch and bamboo houses are nestled in the lush orchards. The famous Vietnamese poet Nguyen Dinh Chieu was born in Ben Tre Province, but until now this fact hasn't spawned touristic exploitation. If you would like to experience a boat tour, I highly recommend you to do it with DinHo Ecotour. There is a ferry from Vinh Long Province to the north-western part of the island, again you may want to hire some sort of transport to cover the remaining distance to Ben Tre town. You will need a taxi (moto ~ 20,000 Dong for 10min ride). There is also bus 8 from ferry pier 4km east of Vinh Long city to Ben Tre. It seems frequent, costs 19,000 Dong (May 2016) for 2h trip. Pay attention when arriving in Ben Tre as the bus goes through town centre before going to outer bus station, so you can get & early & save a taxi fare. Best seems to stop at the roundabout after the two big bridge and Mat Kinh Dien Bien Phu optic shop and take a taxi (moto ~ 15-20k Dong) to the town center. Direct (mini-)bus services from Ho Chi Minh City are to be found at Mien Tay bus station. A new bridge, constructed in 2009, now connects the city to My Tho so the bus ride is direct, without a ferry. You can find the location of Ben Tre bus station on Google Maps easily with the keyword "Bến xe Bến Tre". Thinh Phat Bus - 25A Su Van Hanh Ward 9, Quan 5, Ho Chi Minh City - leaves every hour from 5 AM -7.30 PM, for 65 000 VND. Minh Tam Bus - 204C Sư Vạn Hạnh, Ward 9, Quan 5, Ho Chi Minh City - leaves every hour from 5 AM - 7.30 PM, for 65 000 VND. Hoang Khai Bus - 86C Hùng Vương, Ward 9, Quan 5, Ho Chi Minh City - leaves every hour from 5 AM - 7.30 PM, for 65 000 VND. The town is stretched along the river, so a bicycle or a motorbike seem to be the best way, especially if you are planning to take it to the orchards on the far side of the river. Bicycles can be hired from the large Ham Luong hotel on the north bank of the river ~1km west of central market. Ask nicely at reception. Tips: The schedule for the buses is flexible. So you must to wait about 10~ 30 minutes. The buses work from 5.00 AM - 5.00 PM. The buses usually stop at the bus stations, but you can wave your hands to ask the bus stop anywhere on the the roadways. People in Ben Tre don't use the the number of house and the name of the streets to locate, so don't try to ask the local people with those kinds of information. It will be easier to give them the name of the places you want to visit. Example: You want to arrive in a hotel, which is nearby the Truc Giang Lake, just ask the people how to go to Truc Giang Lake or the name of the hotel (In Vietnamese, it is: The name +".... ở đâu?" - sounds as "er dou", means "Where is ...?"). These are some tips to travel around Ben Tre and visit some attracted places in Ben Tre (local villages, historic places,..) by Bus. Bus 01: Tiền Giang Bus Station (Bến xe Tiền Giang)– Cổ Chiên Bridge (Cầu Cổ Chiên). With Bus no. 01, you can travel around the center of this little city. This bus departs from Tien Giang Bus Station (Bến xe Tiền Giang), goes over Rạch Miễu Bridge (Cầu Rạch Miễu), then goes along National Roadway 60 (Quốc lộ 60), to Tân Thành Crossroads (Ngã tư Tân Thành), to Đồng Văn Cống street ("đường Đồng Văn Cống" or "Lộ mới" - New National Roadway). You can find the tourist company provide the boat tour at the foot of Rach Mieu Brdige. The bus turns left on a crossroads (Ngã ba Rùa - Turtle Crossroads), then continue moving to Nga Nam Market (chợ Ngã Năm). You can stop here, visit the market and Vien Giac Pagoda (Hoang Lam Street, Ward 5, Ben Tre City, Phường 5, tp. Bến Tre, Ben Tre, Việt Nam). Then, the bus goes along Cach Mang Thang Tam street (đường Cách Mạng Tháng Tám - or - August Revolution Street), and Dong Khoi Street (the main street in this city). You can stop in the center to visit the Ben Tre market, the most important market in Ben Tre city, or Sense City Mall. The bus will go back 60 National Roadway, then goes over another big bridge - Ham Luong (Cầu Hàm Luông) to Mo Cay District area (Huyện Mỏ Cày). It will continue going along 57 National Roadway, to Mo Cay Town (Thị trấn Mỏ Cày). Mo Cay is the original place of coconut candy. You can visit around this small town to buy coconut candy or some fruits. Along 57 National Roadway, you can visit the Coconut Fiber Traditional Handicraft Villages in An Thạnh, Khánh Thạnh Tân,.. or Mat Traditioonal Village in Thành Thới B. 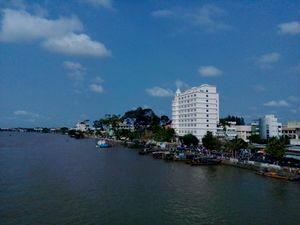 The final destination is Co Chien Bridge, which connects Ben Tre and Tra Vinh. It departs from Ben Tre Bus Station (Bến xe Bến Tre), goes along Dong Khoi Street, and Nguyen Dinh Chieu Street. Taking a tour along the rivers in Con Phung Island is one of the most popular activities in Ben Tre. From Ben Tre city, take the bus no 01 or a motortaxi ("xe ôm") to Rach Mieu Bridge or Rach Mieu Ferry, you can buy a ticket of the tour easily. Price is about 100,000 VND - 200,000 VND (5 USD - 10 USD) which depends on the number of people. OR taking a private tour by boat along the river, the small canal and smaller canal and by bike along village paths with both sides of tropical fruit farms and vegetable farms in Ben Tre city "Simple and Rustic" - DinHo Ecotour. Take the bus no 07 to Provincial Street 887 and then take a motortaxi, you can visit Con Oc Island easily. This islands will give you the memorable experiences of local life in Ben Tre. Nguyen Dinh Chieu Poet's mausoleum (Ba Tri) is also worthy to visit, especially in Ben Tre Traditional culture days (July 1st). Every 4 years, there is a Coconut Festival with many exciting traditional activities. The last festival was from April 7th - April 13th, 2015. You could have a look at the unspoiled market or visit the rice wine factory on the south bank, 0.5 km west from the old bridge. You can also visit the inevitable coconut candy factory here. It's a must if you haven't been to one yet, since in this "factory" basically everything is done by hand. You also can visit the Traditional handicraft villages such as: My Long - Son Doc Rice Paper Villages (Ba Tri), Cai Mon Fruit and Flower Village Cho Lach), Hung Phong Coconut handicraft village (Giong Trom), Phu Le Traditional Alcohol village (Ba Tri). Tips: Ben Tre has most beautiful scenes in Mekong Delta and they are still be very original. Rent a bicycle and riding around the streets in countryside is really an memorable experience. Inside the city area, it is recommended to ride bicycle along 883 Streets ( Đường huyện 883), Binh Phu village, and My Thanh An Village. If you have enough time, riding bicycle to other districts (Mo Cay Bac, Chau Thanh,..) is also amazing. Trung Tam Dieu Hanh Du Lich Ben Tre (Ben Tre tour operation center) or DinHo Ecotour has some private tours in Ben Tre by boat, by bicycle or by tuk tuk and homestay tour. It also gives some information on the city. There is a complex of CoopMart supermarket and Sense City Shopping Mall with air conditioning (food, department store, game center) near 'Cong Vien Dong Khoi' park, north of the lake/pond. There are many small local markets in every area in the city. If you want to buy the fresh food, the best markets to buy will be Ben Tre market in the center and "Chợ Đầu mối" (Ward 8) next to Ca Loc Bridge. The usual food stalls are found around the market. Be warned that one of the favourite soups in the Delta, Hu Tieu, contains boiled intestines and liver, so choose wisely. There is also a floating restaurant near the old bridge. Sweet bakery for breakfast? Go to the huge CoopMart (8-22) just behind Hai Ba Trung street. It's very good and on budget. Some local specialty foods are "Chuối đập" (grilled banana), "Bánh canh bột sắc thịt vịt" (a local noodle dish with duck) or "Bún riêu" (a type of noodle). You can find "Chuối đập" at Truc Giang lake in the center of Ben Tre city, "Bún riêu" at Tu Dien Crossroads ("Ngã ba Tú Điền"), and "bánh canh" at any food street vendor on Dong Khoi street. Coldest beer in Ben Tre? Go to the Oasis. Bar closes at 9.30pm. Club 007: Most popular nightclub in town. Extremely loud techno(earplugs recommended). Only busy on weekends. Mostly 18-30 year old crowd with some slightly older, wealthy locals in the VIP area. to Ho Chi Minh City: 70k Dong, on tran quoc tuan street north of the lake/pond. If you take Thinh Phat you can buy a return ticket at the station, the last bus of each day is 7:30 p.m.
to Vinh Long: take a local bus (number 8) to Pha Dinh Khao. The bus takes hour and a half, costs 20.000 dong (March 2015). The final stop is 100 metres from ferry pier. A short ferry ride (1000 dong) will take you to Vinh Long. The cargo boats also will take you to places like Tra Vinh, Can Tho or Vinh Long. The boats leave between 8h30 and 9h every day. It takes a very long time, but it's a adventurous and cheap option (expect to pay between 60.000VND and 120.000VND each person). They leave from the area east of the new bridge. Boats are light blue. This page was last edited on 9 October 2018, at 02:53.